Super cheap flights to Italy: Venice from Prague for €19! Volotea now offers super cheap return flights from the Czech Republic to Italy. 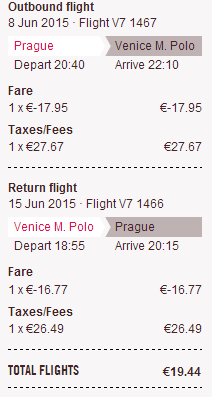 Return ticket from Prague to Venice (Marco Polo airport) will cost you only €19! Most airlines fly to Treviso but Volotea takes you straight to main Venice airport. Travel dates are limited to June 2015. Book here fast, this will be gone in few minutes (you can change language in top right corner)! « KLM celebrates 95th birthday – many destinations available for only €497!